I've been following the Federal Communications Commission and their procedures for establishing new low power FM (LPFM) stations around the country. As many of you know, I have had a dream of owning a radio station for a very long time. But folks with such poor incomes as mine are seldom able to do it. All indications are that the FCC will deal with licensing the waiting list of translators first, which they now say will take the better part of a year. 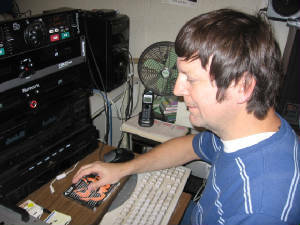 Then, maybe in 2013, or possibly 2014, will they open a new "filing window" for new LPFM stations. Gang, that's okay, and I have an active application for when that time comes, but, I'm sick of spending my life waiting for something that, even after all that time, may not happen. I'm chomping at the bit to do something now. I've decided to put a local legal Part 15 AM station back on the air. Marianne really didn't like for me to climb ladders as I had to do before, to tune, and retune the previous transmitter. It's been off the air since 2009 when some folks who were here to help with home repair cut the audio/power line from the studio to the transmitter in two. I never bothered to put it back on. Now, with the new (to us) radio building and the move there underway, I have already run a new audio/power line out to the tower (which is really a three-pole array in the back yard. I'm planning to go with a different transmitter this time - the Radio Systems iAM transmitter and matching antenna tuning unit. This is more of a polug and play system that can be tuned at ground level. The frequency can also be easily changed if there are interference issies and/or the need arises. I've saved about half the amount needed to buy the AM transmitter and antenna system. If you would like to contribute, you may do so via the station's paypal account. Simply use my email address (alanmccal AT hotmail DOT com) as the recipient. This account's funds all go to Delta Star Radio of Florida, Inc., and are not personal funds to me. Due to the Florida weather, I'm planning to spend the extra $70 for the waterproof version of the ATU. My first Part 15 AM station, on 1160 kHz, was badly damaged during a thunderstorm. Lightning took out an amplifuer and part of the transmission line. It took nearly three years before I could afford to put the station back on the air, this time at 1610 kHz. I had better range on 1160. I hope a few of you will respond, so that I can get this little station built and get some sort of local presence on the air. It appears that the iAM will be sufficient to cover the Lafayette community located about five miles east of Tallahassee. This is also the site of the propsed LPFM, which would be licensed for something like 95 watts, with a 75 foot anyenna. Or 100 watts at 69 feet. Either way, it's a little FM. Might as well have a little AM to get things started here at home.